We Can't Change Others - or can we? It is said that we cannot change others, but what if we really could? Now, I’m not talking about trying to make someone change or even asking someone to change. I’m talking about influencing change through a very radical approach. This Quantum Shift will give you the immediate power to transform virtually every one of your relationships, but first you must be open to the possibility that reality changes and morphs according to you and your thoughts, and you must also be willing to take this responsibility. Granted, it appears that we all share a single universe and everyone is having the same experience of the world, but it is simply not so. The truth is, there are completely different and unique universes for each and every one of us. This means that the universe that you experience is Custom Made for you. This also means that we don’t just see things differently – life is actually responding differently. Those differences are directly related to who we are and how we see ourselves, each other and the world. Indeed, there are billions of different realities going on right now. If we each live in our own personal universe, this means that everyone in your universe is specific to you, and if you shift, grow or evolve, those in your universe must change accordingly. This can be the toughest thing to comprehend, but when you really get it, you have uncovered an incredible power like no other. So, perhaps you are wondering, if there are infinite versions of every person in existence, or more precisely, in your life, what determines which version shows up? The version of any one person that you experience is directly related to who you are – and based on your expectations, beliefs, emotions and even how you see that person. As you shift and change yourself, you immediately experience a different version of the same person. Let’s look at the four ways in which we influence the reality of others. The entire world is unconditionally demonstrating your beliefs. There is no such thing as unconscious beliefs because life is constantly and consistently manifesting your beliefs. Everyone who shows up in your day is reflecting your personal beliefs, about life, about you and about them. If you believe the world is a hostile place, you get hostile people. If you believe most people are kind, people will demonstrate kindness. How you feel, at any given moment, sends out a vibratory energy that life immediately reflects back to you. This is the law of attraction. If you feel happy and light hearted, others will reflect that, and if you feel down and depressed, others will reflect that, as well. What you expect in any situation directly influences what you will experience. Have you ever found yourself saying, “I knew that would happen”? Have you considered that it was your knowing that actually made it happen? People cannot show up any better or different than you expect them to. Most of the time, we base our expectations on how we judge someone or how they have shown up in the past. What we fail to understand is that our expectations and judgements actually lock in those negative aspects of that person. How you see a person at any given moment calls forth that version of that person. This means if you are judging someone or focusing on the things that you do not like about that person, you will experience exactly that. If you want to know how you see someone, notice how they show up for you. So, how does this work in real life? Imagine moving into a new neighborhood and finding out that your next door neighbor is irrationally angry with a history of violence – hated by every person on the block for his unkind acts, outward hostility and arsenal of weapons, which he displayed when feeling the least bit threatened. What would you do? Most people would go right along with the neighborhood viewpoint – thinking of this man as the negative being that he appeared to be, and experiencing just that. Well, I have a dear friend who found herself in this exact situation, but instead of joining the ranks of her defensive neighbors, she decided to do something completely radical. She decided to love this man and think kindly of him. She disregarded every derogatory idea about her next door neighbor, and she chose to see the best in him – but, because he didn’t show this “good side” to anyone, she made it up. Then the most interesting thing happened – he actually became the person that she had imagined him to be; continuously showing her kindness and good will – he even began to smile. At first, the rest of the neighborhood didn’t experience this kind and loving man. They still got the hostile grumpy version, but little by little, over time, the man began to show up differently for the neighbors, and they also began to see him more harmoniously. All because one person had the courage to think differently. It is our egos that keep us from shifting our viewpoints about others. We believe that if people act badly in any way, they deserve our negative attention, even if it is silently to ourselves. Because we feel justified in seeing them in a negative light, we lock in that version. But, who does it serve? We are really punishing ourselves by trying to punish them. On a grander scale, we are even contributing to the negativity of the planet. It is our private shift in consciousness that allows another version of reality to be experienced. Simply seeing someone in a more positive manner, aligns you with a more positive version of that person. Playing the victim of your reality? Anytime that you fail to take responsibility for your experience of reality, you choose to play the victim. As long as you blame another, you give away your power to change – and, yes, even change the other person. When you blame someone for hurting you, you lock in the very thing that you are blaming him/her for. In other words, if you blame someone for disrespecting you, you anchor the “energy of dis-respect” into that relationship. Our reactions are like universal requests. In this case, the universe hears, “More disrespect please.” As a result, disrespect may show up in other relationships, as well. Before you know, everyone is treating you in the same negative manner. The healing for this dysfunctional dynamic is complete self-responsibility. If someone is dis-respecting you, ask yourself, “How am I dis-respecting myself?” When you make the course correction in yourself by giving yourself respect, the outside world will generously reflect it back. If someone cheated on you, how are you cheating yourself? If someone judges you, how are you judging yourself? If someone annoys you, how are you annoying yourself? You can even turn it around, how might you be cheating, judging or annoying others? If something is being done to you, it is only because it is being reflected back to you, in order for you to know your inner self, so that you can make course corrections when desired. Everyone in our lives serves us by reflecting both our conscious and unconscious beliefs back to us. This means that the people in our lives are merely outwardly demonstrating what we are inwardly doing to ourselves. Therefore, if we want others to treat us better, we must first treat ourselves better. No one can do to you, what you first don’t do to yourself. Your life is a personal journey through your own subconscious mind. Nothing is happening outside of you. It is all happening within you. It is all you. This gives you complete power and access to changing or re-creating anything you want. This is the genie in your bottle. The Ho'oponopono is a Hawaiian Philosophy that says that everything in our consciousness is a part of us and therefore we are responsible for everything that we are even aware of. In saying, I am sorry, he took responsibility for creating the negative reality. In asking for forgiveness, he was letting go so the divine healing could unfold. After a few weeks, conditions began to improve. After a few months, there was less violence, the guards were not quitting as they were previously, inmates were less medicated and there was a higher spirit to everyone. As time went on, things consistently continued to improve, and inmates were being released and not returning. In less than four years, the prison was closed because there weren’t enough inmates to keep it open. How could one man make such a difference? He orchestrated this extraordinary Quantum Shift simply by taking complete responsibility for everything in his awareness and healing the part of him which created it. If something or someone is experienced through your consciousness, you are dreaming it. If you are dreaming it, you are responsible – and you can change it. Just as your nighttime dreams are a reflection of your unconscious mind, so is your real life dream. Find the part of you that created who or what you want to change and heal it. Healing is always about letting go. The only reason we ever suffer is because we hold on. Identify the illusion that you have created and believed – then let go and be healed. Until we fully awaken, the purpose of life is to show us the illusions that we believe so that we can let go and return to wholeness. Every relationship and shared experience is a complementary reality, which means that our beliefs complement each other. That doesn’t mean that we share the same beliefs. Often complementary beliefs are opposing beliefs. For example, someone who has abandonment issues may attract a partner who is afraid of commitment. These opposing issues (beliefs) are complementary because they fit together perfectly to play out a particular story. Everyone who participates in your life has agreed, on a non-physical level, to play out your stories and act according to the scripts you unconsciously write, and you do the same for them. At least until you become conscious – and responsible with your consciousness. The version of any one person who shows up for you in your story, is the version of this person that complements your story-line. If this person is no longer willing to play the role that you assigned, they simply leave the story, and if you still have the same script going, someone else will fill the role. This is why we often attract the same types of people over and over. If you don’t like the dynamics of a current relationship, you can change the relationship by changing the story – which of course, means changing your beliefs that create the story. Let’s say that you are tired of a particular painful story-line, such as being abandoned. In order to be with a partner who desires commitment, the key is to heal your abandonment issues. If you don’t like how someone is showing up in your life, look inside and find the corresponding negative belief in you, release it and replace it with a belief that will allow that person to show up in a more positive manner. When you heal your disempowering beliefs, higher versions of the people in your life will show up to fulfill the new roles according to your new story, or if they don’t want to change, they will easily leave your life, making room for a better match. How do you know what story you are telling? Well, that’s actually quite easy. What are the thoughts that you have about the relationship and the other person? That is your story. In other words, if you often think, “She doesn’t understand me, or he doesn’t care,” that is the story that you are creating. You might argue that you are only saying how it is, but it is how it is because of the things that you say – and even think. Should you ignore reality? Well, why focus on what you do not want? It makes no sense. Instead, place your focus on what you do want. Change the story and keep telling the new story until reality shifts – and it will, as long as you consistently tell the new story without questioning it. It takes mental effort for sure, but your mind has the ability to shift reality, in ways that nothing else could possibly come close. You take your power back from reality by remembering that your thoughts, feelings and beliefs are creating your reality, and instead of waiting for reality to shift so that you can feel better or think better thoughts, it is up to you to change your reality by mastering your mind and emotions. The ECHO from past realities. Sometimes others change as soon as we shift our thoughts, feelings and beliefs, but more often than not, there is a delay. What we experience at any given time is an echo from the past. You might say that the present moment is actually the past because there is a gap between the projection of reality from our subconscious minds and the experience of reality through our conscious minds. Much like the time gap between the projector in the back of the movie theatre and the movie screen where we watch the movie. Knowing this, gives you the insight to be committed to your new way of thinking. Be patient — allow some time for the new reality to show up in your life. In other words, don’t give up – stay focused. Once we shift our thoughts, beliefs and expectations to a higher version of the same person, there is often corresponding action on our part. In many cases, this involves setting boundaries and teaching people how to treat us, including how to speak to us, and respectfully enforcing those boundaries if someone crosses them. Be the person you want the other person to be! As long as you react in ways that you don’t want to be treated, you perpetuate the negative dynamic and lock in the behavior of the person you are wanting to change. For example, instead of reacting to resentment with resentment, respond with compassion and understanding. Make peace more important than being right or defending yourself. Be the person – you want the other person to be! We are talking about playing big, and I know that this might be a huge jump for some, but it is how we bridge the gap to an age of enlightenment. Do you really think that enlightened people go around blaming each other for their circumstance? The thing is, whether you take responsibility for your life or not, you are no less responsible, but without taking responsibility, you make yourself powerless to change your world or to change others. As long as you believe that anything is happening outside of you or happening to you, you give away your power to transform reality. There is a direct correlation between how awake you are and your willingness to take responsibility for your life – for your world. The more responsibility you acknowledge, the more you awaken, and the more you have access to an infinite power. You cannot be awake and giving away your power at the same time! If you want to live in an awakened world, you must wake it up by remembering that you are creating it – the good, the bad and the indifferent. The bottom line is self-responsibility. But this is the best news ever, because now you have access to the law of conscious creation. It is time to stand on your mountain top and shout out, “This is my life. This is my Universe.” As Master of Your Universe, what will you create? Who will you become? Magic happens. Miracles happen. But nothing happens until you choose. 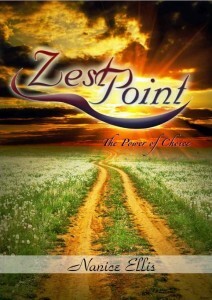 “Zest Point – The Power of Choice” is also available on Amazon in kindle and paperback editions.